Bengaluru, 29 June 2016: The Akshaya Patra Foundation which runs the World’s largest mid-day meal programme has launched Akshaya Patra app. The App was launched by Mrs Sudha Murty, Chairperson, Infosys Foundation and T.V. Mohandas Pai, Chairman of Manipal Global Education at Vivanta by Taj, Bengaluru. Akshaya Patra mobile app puts the power to stay connected with The Akshaya Patra Foundation. It’s a user friendly app that tracks all the important news and events of the foundation. About The Akshaya Patra Foundation: The Akshaya Patra Foundation is a not-for-profit organisation headquartered in Bengaluru, India. The organisation strives to fight issues like hunger and malnutrition in India. 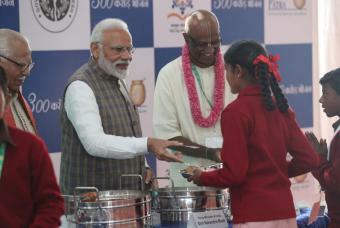 By implementing the Mid-Day Meal Scheme in the Government schools and Government aided schools, The Akshaya Patra Foundation aims not only to fight hunger but also to bring children to school.